noun: The leader of a company, group, etc. From the use of bananas as a prop in burlesque shows. Earliest documented use: 1947. A person in a secondary role is called a second banana. Jeffrey A. Trachtenberg; Pioneering Barnes & Noble Leader to Step Down; The Wall Street Journal (New York); Apr 27, 2016. 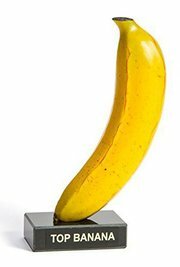 See more usage examples of top banana in Vocabulary.com’s dictionary.